Peterborough defender Michael Smith is aiming for a place in Northern Ireland's Euro 2016 squad. The 27-year-old made his full international debut in Northern Ireland's 1-0 home win against Slovenia. "Michael O'Neill said there are spots up for grabs on that plane for France," Smith told BBC Radio Cambridgeshire. "They're going to be watching players to see who he's going to take. I just need to play my best at club level." 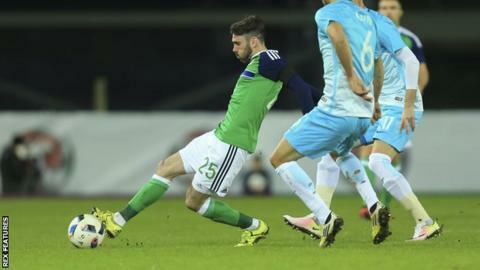 Smith, who was an unused substitute in Northern Ireland's previous game against Wales, played at wing back against Slovenia. "I think I played about 70 minutes so hopefully my foot is in the door now," he continued. "Hopefully I continue to play well at the club and get another call up." The defender, who has made 39 appearances for Peterborough this season, was able to help Northern Ireland extend their unbeaten run to 10 games with his first appearance. "I didn't let anyone know to be fair," he added. "My mum was about the only person who knew, just in case he (Michael O'Neill) had a last minute change of mind. "It gives you a lot of confidence and I'm proud to say I'm an international player now."